Woot.com has been serving up daily deals with a side of irreverent humor since 2004. The combination of clever wordplay and big savings - on everything from umbrellas to bed sheets - has helped the company build a passionate online community. To buy on Woot, customers first create an account, which not only enables them to purchase but also to engage in the site’s forums. To make signing in and signing up easier, Woot launched Amazon Pay, a service from Amazon Pay that lets Amazon customers easily create a profile and then buy with the information already stored in their Amazon account. 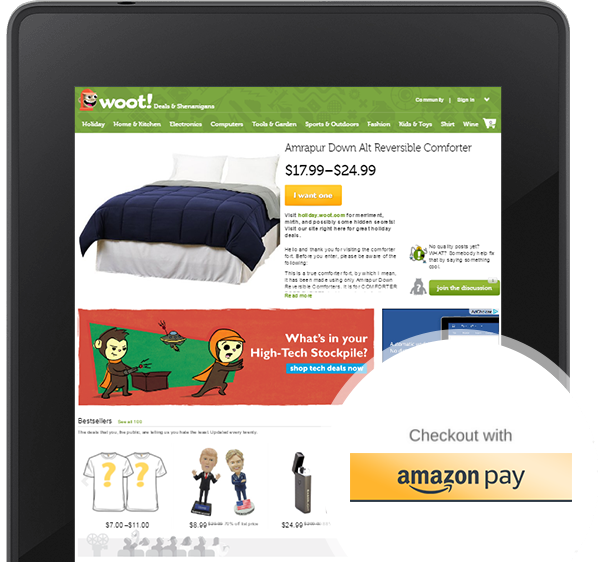 Woot sees the rapid adoption of Amazon Pay as evidence of its value. “Amazon Pay became very popular on our site very quickly and now accounts for almost a quarter of our overall revenue,” says Chang. When asked what she thinks has driven customer adoption, Chang points to a third-party usability study Woot commissioned before launching Amazon Pay. After walking through the login and payment experience, participants were asked for their feedback. Adding Amazon Pay to our site has absolutely been worth the development work. Our customers love it, and we love the results we've seen. Those new customers have proven to be a valuable source of incremental revenue, spending more on average than customers who don’t login with Amazon. “Customers who use Amazon Pay buy higher priced items and spend over 5% more per order than customers who choose other payment options,” Chang says.